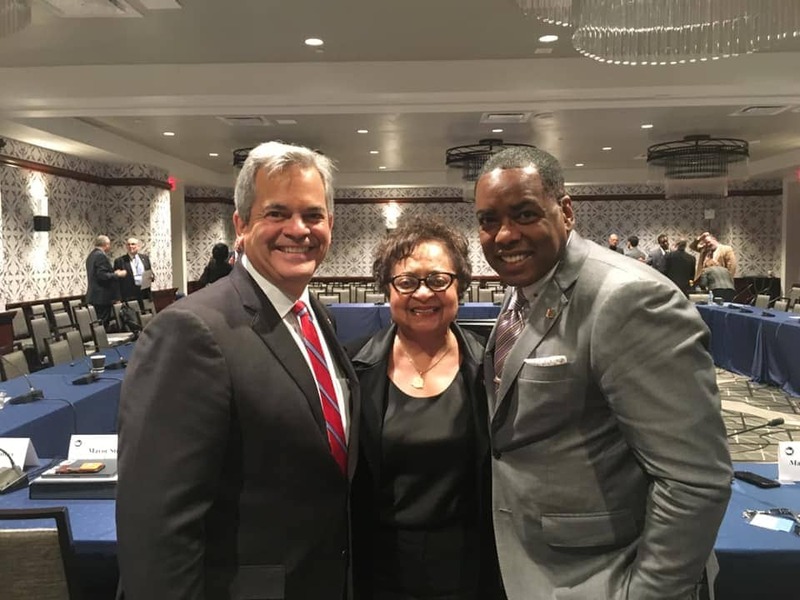 Home News McCowan Attends U.S. Mayoral Conference In Washington D.C.
McCowan Attends U.S. Mayoral Conference In Washington D.C.
DeSoto Mayor Curtistene McCowan with her colleagues Austin Mayor Steve Adler and Plano Mayor Harry LaRosiliere. DESOTO—As the federal government shutdown reached day 35, more than 100 mayors from across the country descend on Washington. Representing the All-American City of DeSoto, Texas is Mayor Curtistene McCowan. The three-day conference was held January 23-25 at the Capital Hilton and brought together officials, members of Congress, as well as business and community leaders to explore innovative solutions to the issues facing American cities. One such confirmation was the recent opening of the DeSoto Business Incubator. In June the refurbished 26,000-square-feet former Westlake Ace Hardware Store afforded local business owners commercial space and support to sell their wares and develop their businesses. With more than 85 percent of Americans living in U.S. metropolitan areas, mayors are on the front-lines of today’s challenges and have consistently called on Washington to draw on mayoral expertise. During the Meeting, mayors from both sides of the aisle, from cities rural, urban and suburban, held sessions on a range of priorities, including infrastructure, immigration, border security, opportunity zones, climate, automation and the economic future of cities. Joshua C. Johnson is the executive editor of Focus Daily News, a daily publication in DeSoto, Texas. For the last ten years Mr. Johnson has steered the periodical that reaches more than 35,000 homes daily and is the official paper of record for DeSoto, Duncanville, Cedar Hill, Lancaster and Glenn Heights, Texas. Under his leadership the paper has won a number of awards from the Texas Press Association, the Dallas Bar Association and the Dallas Press Club.